A bayonet to the back. Redcoats turn redder. When his Mohawk village falls to arson, killing his mother, Connor — the half-English, half-Native American protagonist — leaves his tribe to protect his people’s sacred land. He vows to stop those who want it, including Charles Lee, who plans to assassinate George Washington and take control of both factions of the Revolutionary War. Connor knows he’s in a losing battle and that his tribe will eventually fall to the victor of the American Revolution. Issuing death to both the British and patriots, temporary alliances are chiefly with the lesser of the two evils. Though fictional, there’s a historical, sociopolitical dilemma at the center of Assassin’s Creeed III, giving Connor’s actions a moral drive, yet an ambiguous meaning. Like Forrest Gump, Connor fortuitously participates in pivotal moments of American history, including the Boston Tea Party and the Battle of Bunker Hill, even befriending Benjamin Franklin (of $100 bill fame) and Samuel Adams (the beer guy). 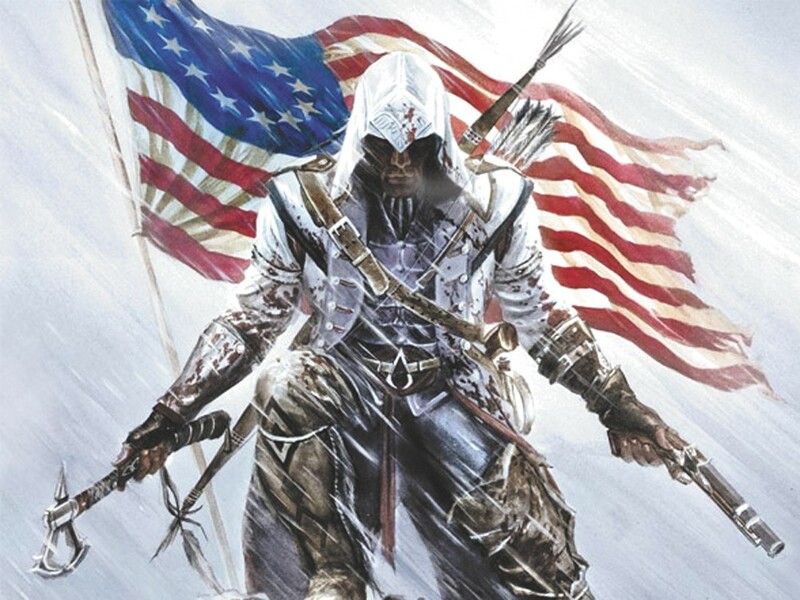 Bayoneted muskets, tomahawks and dual hidden blades are only a few arrows in Connor’s quiver of “tools.” Although brawls can be simple, the various animations of Connor reddening the Redcoats’ uniforms rectify it. Captaining a Revolutionary warship and its cannons? Pretty sweet, too. The free-running mechanics remain superlative. Every piece of architecture doubles as a jungle gym, allowing any colonial tavern, ship mast or tree to be scaled with ease. Colonial Boston and New York feel authentic and lively, burgeoning with brick buildings and shops. They’re juxtaposed with the expansive frozen frontier and its sparse settlements, providing much-needed variety to the vertical sandbox aesthetic. Unfortunately (as series fans know), there’s a modern day storyline that intertwines, and you’re occasionally yanked out of Colonial times and dictated to partake. This is when the game flounders in convolution. Thankfully, each time you return to the Colonies under Old Glory — to the sprawling world governed by meaningful historical fiction — this frustration is forgotten.